The Wheels of Justice want some payback. The Rose City Rollers all-star team heads to New Orleans this week looking to reclaim the Hydra Trophy. The Portland team, runner-up in 2017 and world champion in 2016, is seeded No. 2 in the Women's Flat Track Derby Association's international championship tournament, which takes place Friday through Sunday at Lakefront Arena. One notable change since Australia's Victorian Roller Derby beat the Rose City Rollers all-stars for the 2017 title: The schedule changed so most teams play only once a day. "It's a change that's been needed as the game has become more physical and harder," Rose City captain Bonnie Thunders says. "It's a little bit much to ask any athlete to play two of these roller derby games in one day." 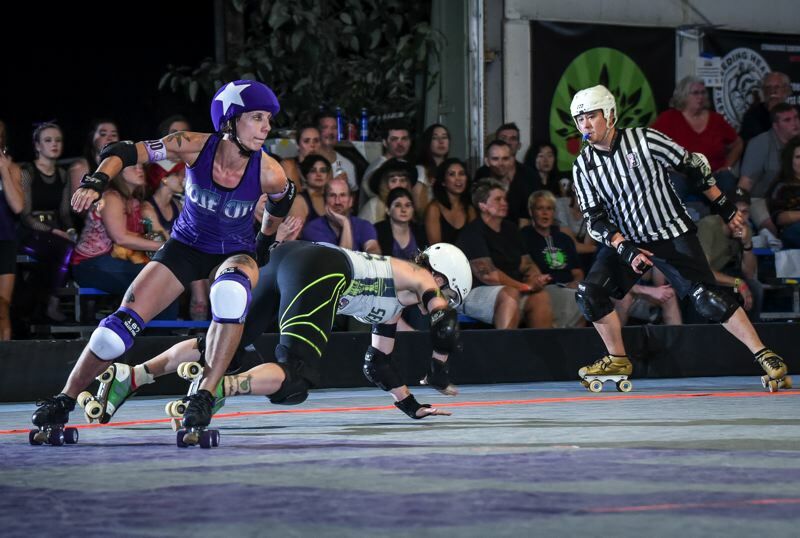 Led by Thunders, considered the best skater in the sport, the Rollers all-stars have a 7-1 record in 2018. The loss came to Victorian on Sept. 16 in a tournament at Denver. Among their wins this season is a 126-124 victory over Gotham Girls Roller Derby. The team from New York City is the No. 3 seed, meaning a semifinal showdown with Rose City if both advance through the quarterfinals. Wheels of Justice will open Friday with a quarterfinal against the winner between Montreal Roller Derby and Crime City Rollers of Malmo, Sweden. WOJ beat the team from Sweden, 231-94, in a June tourney at Portland. "We're likely to see all opponents we've played earlier this year, which is rare," says Thunders, a native of New York state who is in her 13th season of competitive flat track roller derby. WOJ has new faces, too. A group of veteran players retired after the 2017 tournament. Thunders says that has made the run-up to the championships a challenge. "I still think we are fully capable of winning it all. But something other teams have that we're still working on is that long-standing chemistry between skaters," Thunders says. Thunders, whose real name is Nicole Williams, for 11 seasons starred as a jammer for Gotham Girls. Thunders helped the New York City team win five world titles and has won multiple world championship tournament MVP awards. Thunders says her greatest accomplishment is longevity in the sport, having competed at every WFTDA international championship tournament since 2007. Thunders and her partner, Drew Flowers (roller derby name is OMG WTF), moved to Portland in December 2016 seeking a mellower lifestyle in a progressive, environmentally aware community. They also wanted to expand Five Stride Skate Shop, their skate sales business. The Rose City Rollers, the largest roller derby program in the world with 300 adults and 300 youth skaters, also was a strong selling point. The leadership of Thunders and a few other veterans will be vital this year. She is one of the team's four experienced jammers (the skaters who can score points by lapping opponents). National team member Lauren Mutch, Brute and Beyond ThunderDame are others with jamming experience. The team's other jammers, EveAnn Hellical and Zip Drive, have jamming experience but not at WFTDA Division 1 tournaments. The four blockers returning from last season are co-captain Elicia Nisbet-Smith, Simonis, Tarantula and Gal of Fray. The Rollers have added some key skaters from other teams, including Thunders' partner and Polygamy Winehouse, a native of Finland who has competed in Sweden and most recently skated for London's top team in England. Most of the newcomers have climbed through the Rollers' development system to make its top all-star team, though this year's team includes transfers from Barcelona, Spain, Nashville and northern California. Might youthful enthusiasm make up for a lack of experience at the WFTDA championships? "While that might seem like a lot of pressure, you don't really feel the pressure until you've done it once. You still have this romanticized vision of it," Thunders says. "I think that actually works in our favor a bit because so many of our skaters are young and really hungry and really excited and ready to show everybody what we've got." Ten teams compete in the international championship. Rose City is one of four that qualified based on the rankings as of June 30. In recent years, the trophy has landed in Australia, Portland and New York City, and those three programs are expected to again battle for the title. Thunders says that Gotham Girls' strength comes from having a well-established program with excellent player development. "So there's that chemistry they have, but also there are constantly new people that train up, and they're able to integrate those people easily," she says. Victorian's edge is having an entire country from which to draw players. "Victorian has a special edge because they are the most premier league in all of Australia, so they get the majority of the transfers in the entire country who want to play up at the highest level," Thunders says. Portland's advantage is having 600 skaters involved in its youth programs and adult leagues. "Rose City has the biggest program in the whole world," Thunders says. "That also lends itself to having a huge number of skaters to pull from to create our team."